Lambeau Field can now officially be called the home of the world's longest bratwurst. GREEN BAY, Wisc. 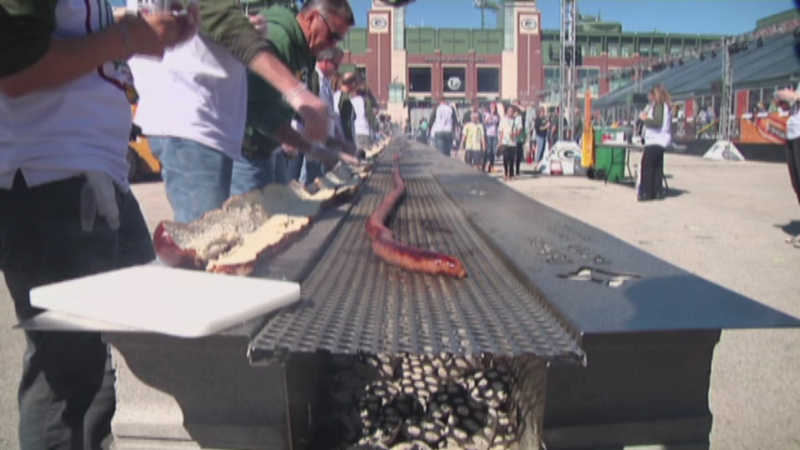 (WLS) -- Lambeau Field can now officially be called the home of the world's longest bratwurst. The record-setting 250-pound Johnsonville brat was grilled to perfection in Green Bay while the Packers battled Bears at Soldier Field Sunday. The Johnsonville factory made the brat 120 yards to match the length of the iconic football stadium, with a grill to match. A party for the brat raised about $40,000 for local charities.